The EaglesThis all American country rock group was formed in 1971. They were originally put together as the backing musicians for Linda Ronstadt and they gelled together so well that they decided to form a band after their first gig in Disneyland. Their early sound was a combination of country music and Surf Rock. Their first album, which was released in 1972, was a million-seller. I’m talking about The Eagles. In 1971, Glenn Frey singer/guitarist was approached by Linda Ronstadt’s manager, John Boylan, to form a backing band for her. He approached drummer/singer Don Henley, guitarist/singer Bernie Leadon, and bassist/singer Randy Meisner. The band signed up with a new label Asylum by David Geffen who linked them up with producer Glyn Johns to record their first album Eagles(1972), which was done in London in less than three weeks. Glynn guided them towards a country-rock sound that they would become famous for, producing the hits Take It Easy, Peaceful Easy Feeling, and Witchy Woman. It was released in June, reaching the Top 20 and going gold in a little over a year and a half. The first single "Take It Easy" got them instant national recognition. Another single, "Witchy Woman" hit No.9 on the charts. The Eagles toured throughout 1972 and into early 1973. They then returned to England to record their second LP, Desperado, a concept album about outlaws produced by Glyn Johns. Halfway through recording they wanted a more rock-oriented sound and moved recordings to California with producer Bill Szymczyk. It was released in April 1973, and reached the Top 40 and went gold in a little less than a year and a half, producing the Top 40 single "Tequila Sunrise" in the process. The title track, though never released as a single, became one of the band's better-known songs and was included on the Eagles' first hits collection. Guitarist-vocalist Don Felder joined in 1974 because he was needed for guitar-work on the next album. Joe Walsh replaced Bernie Leadon in 1975, and Timothy B. Schmit replaced Randy Meisner in 1977. On The Border is released in 1974. The single "Best of My Love" hit No. 1 on the adult contemporary charts. This also gave the Eagles' their first gold single record as well as multiple Grammy nominations. In 1975, the Eagles are ready to release their fourth album One of These Nights. The title track "One of These Nights," a rhythm and blues song, is released early and the album is gold certified within a week of its release. Through 1976, the band's success is still growing. Asylum released Eagles: Their Greatest Hits 1971-1975 and sold over a million copies upon its release, earning the first RIAA platinum award. It became biggest selling album of all time (28-million) in that category and this album showcases the diverse musical styles the group employed. This album is also the third in history to sell at the million-unit mark upon release. This same year, the band is awarded its first Grammy for the single "Lyin Eyes." The band with the new lineup released their next album Hotel California, receiving outstanding commercial and critical success and reaching No. 1 on the Billboard Charts and goes gold. At that point, Hotel California sold nine million units. 1977 is spent touring the US, Canada, England, Scotland, Europe, and Scandinavia. 1978: The Eagles got two Grammy awards: Best Vocal Arrangement for "New Kid In Town" and Record of the Year for Hotel California. The band spent a year and a half recording The Long Run. During recording breaks for this album, the Eagles released "Please Come Home for Christmas" and "Funky New Year." The single became the first Christmas record to break into the top 20 on national music charts in over 20 years. "Heartache Tonight," hit number one as a single, and "I Can't Tell You Why" and "The Long Run" became Top Ten hits. "Heartache Tonight" won the 1979 Grammy for Best Rock. 1980: The Eagles toured the U.S. and at a week-long series of shows at the Santa Monica Civic Auditorium, they recorded Eagles Live. Also included were some tracks recorded in 1976. It was released in November 1980, the double LP (since reissued as a single CD) reached the Top Five and went multi-platinum, with the single "Seven Bridges Road" reaching the Top 40. Between 1980 and 1982 the band broke up, and band members pursued solo careers with varying degrees of success. The huge pressure on them to match and even outpace Hotel Californiamade the already-clashing egos hyper-sensitive as well. The music-making process became an ordeal rather than a joy. Glen Frey was especially unhappy, and started to consider breaking up the band. He made the final decision to do so at a 1980 benefit show in Long Beach for Senator Alan Cranston. When Don Felder declared at a press conference prior to the show that he didn't care a thing about Cranston and had just showed up to play, Glen Frey was embarrassed and angry. They exchanged threats during the show and then afterwards got into a physical fight which ended with Don Felder swinging a guitar at Glen Frey. Glen Frey didn't even want to rejoin the band to mix the tracks for the Live album (1980), sending his parts to the studio instead. He called Don Henley and told him that he wanted to do his own thing for a while. That was it. The Eagles were over. Or were they? 14 years later, in the spring of 1994, they somehow reunited and recorded an MTV concert special and then launched a tour that ended up running through August 1996. They made loads of money. The MTV show aired in October, followed in November by an audio version of it, the album Hell Freezes Over, which topped the charts and became a multi-million seller, spawning the Top 40 pop hit "Get Over It" and the number one adult contemporary hit "Love Will Keep Us Alive." The Eagles next appeared together in January 1998 for their induction into the Rock and Roll Hall of Fame, when the five present members performed alongside past members Bernie Leadon and Randy Meisner. On December 31, 1999, they played a millennium concert at the Staples Center in Los Angeles that was recorded and included on the box set retrospective Selected Works: 1972-1999 in November 2000. Don Felder was expelled from the band in February 2001 and replied with two lawsuits alleging wrongful termination, breach of implied contract, and breach of fiduciary duty, reportedly seeking $50 million in damages. A protracted legal battle ensued as the Eagles battled on as a quartet. In his complaint, Don Felder alleged that from the 1994 Hell Freezes Over tour onward, Henley and Frey had "insisted that they each receive a higher percentage of the band's profits", whereas the money had previously been split in five equal portions. Felder also accused them of coercing him into signing an agreement under which Don and Glen would receive three times as much of the Selected Works: 1972-1999 proceeds. In November 2007, Don released a ‘tell-all’ book Heaven and Hell: My Life in the Eagles (1974–2001). The book was released in the UK and not until April 2008 in US. 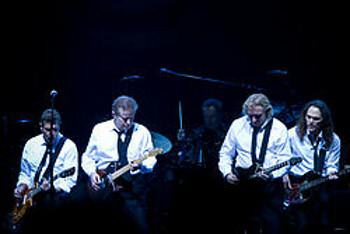 The band released The Very Best of the Eagles in 2003 and achieving minor success with the single "Hole in the World." Don’s case was settled out of court in 2007. 36 years after they started, also in 2007, the Eagles returned with their seventh studio album, Long Road Out of Eden, a double-disc album that quickly went multi-platinum. In November 2010 Timothy B Schmit was asked whether the Eagles were planning a follow-up to Long Road Out of Eden. He replied, "My first reaction would be: no way. But I said that before the last one, so you never really know. Bands are a fragile entity and you never know what's going to happen. It took a long time to do that last album, over a span of years, really, and it took a lot out of us. We took a year off at one point. I'm not sure if we're able to do that again. I wouldn't close the door on it, but I don't know." Also Joe Walsh said that the band might be able to make one more album before the band finally "wraps it up". So let’s wait and see.